The project is a part of our annual work plan “Digital Technology For Democracy: Youth Turns Threat Into Opportunity” and is going to (1) To explore the environment of technology and internet in particular and youth participation within it, (2) To explore what it means to be a digital rights activist and why it matters for participatory democracy and (3) to equip young green activists from Eastern Europe with tools for fair, safe and equal participation in web-platforms. 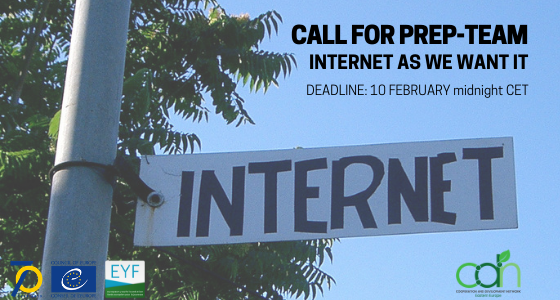 We are looking for young people who are passionate about digital activism, Internet and the values of the Green movement to be part of the prep-team. Help with the reporting of the evaluation, reporting and following up on the event. Accommodation, food, working space, travel and visa costs for the preparatory team will be fully covered. For the selection of travel means the condition is to combine the most economical and environmentally friendly way (lowest price + travel time + CO2 emissions). DEADLINE for submitting the application is 10 February 2019, Sunday midnight CET. You can apply using this application form. For any further information do not hesitate to contact us at office@cdnee.org. This Project is supported by the European Youth Foundation of Council of Europe.